Sailing Quiz - What Happens Next? We use our Sailing Quiz, popular on all out social media channels, to discuss great sailing images. By popular request, we wanted to bring a more in-depth version to the blog. Images of sailing can only tell us so much, we can’t know who was on board, what they were thinking or their rationale. But they do make for great discussions. Whether you the Training Officer for the RYA or a first time novice, we really welcome your comments and contributions – comedy answers are especially welcome. A yacht heading toward a rock with a light onTack or bear-away - What clues are there to help? If you look at the image above you will see a yacht heading towards a rock with a light on – it is flashing 6 short and one log (6 +1). The light, at a distance, would identify it and help you make navigational discussions. You GPS, dead reckoning, and other navigational techniques will add to the mix and create a vivid picture of the navigational dangers. You’re at the helm, what indications are there to you about what you should do any why? What are the clues available to you? Do you think you should bear away and ‘leave the rock to starboard’? Or should you consider a ‘tack’ and leave the rock to Port? Please let us know what you think below and we will continue to build the article based on your comments. There is not a lot to go on in the picture. There is broken water to the left of the large rock, but the lighthouse buildings are on the right-hand side of the rock suggesting these are on the sheltered -not the weather side of the rock. With no more information but this picture I would bear away giving the breaking waves a good offing to starboard. In reality I would consult the relevant chart. Can you see the tower is a cardinal? Lots of info in the photo. That's Fastnet Rock, and that boat is racing. 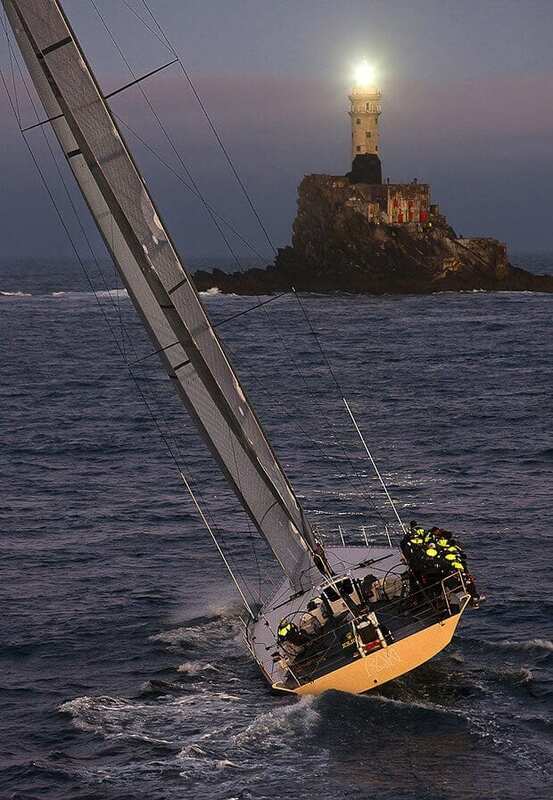 As per the Fastnet Race sailing instructions, they need to tack and leave the rock to port.